Once upon a time, we started a website in the name of our hamster, Hatty, planning to look at the world and what’s going on in it through the little hamster’s eyes. After all, Humphrey and Freddy wrote their own books and diaries. We fully realised that we are painstakingly slow and that we would’t be able to get too far in the lifespan of a hamster. Should we still continue with our plan? We decided that we should. Hatty was the spirit of our house, a charmingly quiet and sophisticated little creature who kept us all in order and harmony. So, we hope she is still guarding and supporting us and our crazy ideas. Because Hatty liked all of these things. 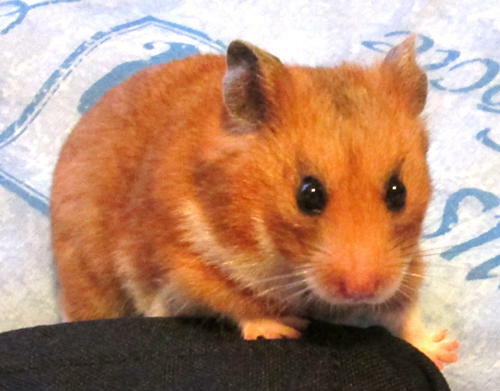 She filled her cheek pouches to the bursting like any respectable hamster should. And ran around in her wheel reassuringly at 3 o’clock in the morning. And tried to escape every time she was put on the floor. Sadly, she never succeeded. A big world with huge scary humans (and even more horrifying cats!) was supposed to be too dangerous. But it was the cancer that took her at the end. We will make complete fools of ourselves in other ways, more appropriate for primates as we are.